There is more to being a goaltender than just stopping the puck. National Elite Hockey Development realizes that new rules have exponentially opened up the game. Those rules combined with the reduction in the size of goalie equipment, better player equipment and ever-improving player skill levels mean that goaltenders have to be technically even sounder, more patient, improve their reads, be quicker on their feet, better at controlling rebounds, be in better shape, be more proficient at playing the puck and more athletic than ever. Great goaltending does not end with skill and technique. These are only the basic foundations of strong goaltending. What separates great goalies from good goalies is mental toughness. Success is not handed down or stumbled upon; it is earned. 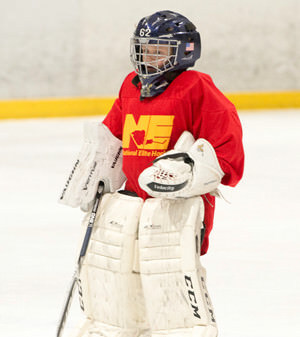 If you want to understand modern day goaltending and possess the ambition to strive for the best, National Elite Hockey’s Goaltending Camps will help propel your game to its highest level.